Auditory feedback is an important aspect of speech production. Delayed auditory feedback results in non-fluencies, and altered speech feedback, e.g., shifting fundamental frequency, results in compensatory speech adjustments opposite the direction of the alteration. What is the neural mechanism underlying this system? That was the question addressed in a recent report by Tourville, Reilly, & Guenther (2008). 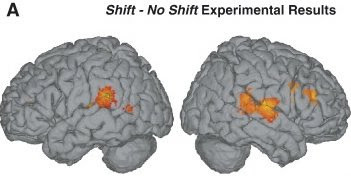 It is no surprise that auditory cortex is involved in registering the shift; it is perhaps interesting that a good chunk of right STG is highlighted in this pitch shift manipulation. The involvement of right pre-motor cortex is a bit of a mystery... But what I'm most excited about is the location of the major blob of activation in the left hemisphere. This seems to be centered right over area Spt, which of course is the region I believe supports sensory-motor integration for speech and related functions (i.e., it translates between sensory and motor speech representations). The observation that this area is involved in auditory feedback control fits perfectly with this view. After all, sensory-motor integration is critically involved in auditory feedback control of speech. My previous posts on the link between delayed auditory feedback and this left planum temporale region converge nicely with this new study. I highly recommend having a close look at this paper. There's a lot more in it than I have the energy to outline here, including a nice computational model (Guenther's DIVA model), structural equation modeling, and very useful literature review.